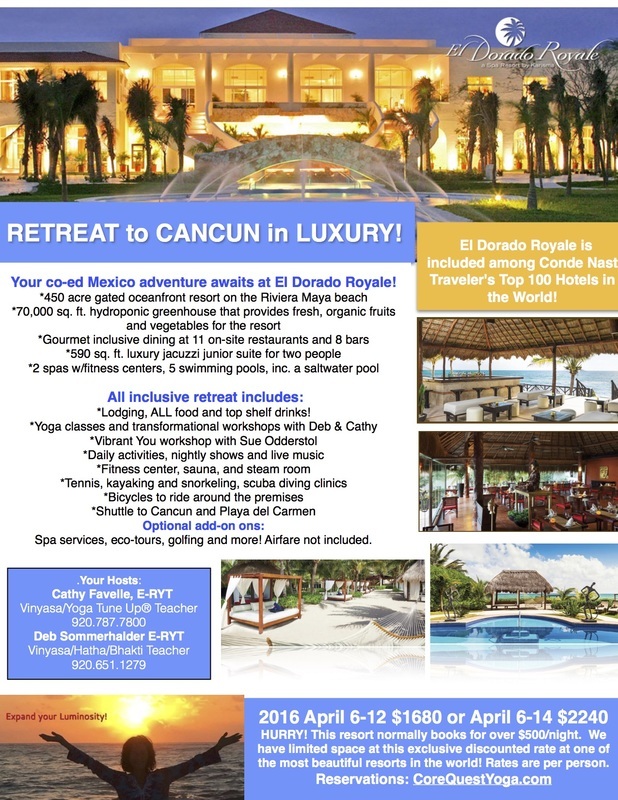 We are excited to announce our next amazing vacation and retreat opportunity at what Conde Nast Traveler has chosen as one of the top 100 resorts in the world and AAA has awarded the 4 diamond rating only given to 5% of all their resorts. In addition to it's commitment to top quality and service, El Dorado Royale has a wonderful respect for the environment with a committed sustainability project, on-site turtle refuge and hydroponic greenhouse! The gourmet dining at 11 on-site inclusive restaurants will take you over the moon, if the beautiful suites and ocean don't do that first. You could be busy all day with activities and get fit fun or grab a hammock with your favorite book and hang out at the pool or spa. We will have some group planned opportunities but this is YOUR vacation in paradise!!! ​Grab your husband, significant other, mother, daughter, friends and JOIN US! Two Room Choices and Two Time Frame Choices! Options for Double or King Size beds. Rates are Per Person based on double occupancy. Mexico requires passports to travel. **Optional room upgrade to Premium: $15 more/day and is like a fast pass at Disney for adults! Included are rooms closer to the beach vs. the luxury are closer to the restaurants/pool. You also get private check-in, personal concierge service (ie: make your dinner reservations, activities, spa services or anything you desire without waiting in long lines. You also receive a champagne and fruit basket in your suite upon arrival and daily pillow and aromatherapy room service as well as a pool butler! We understand that emergencies happen and we want to be as supportive as possible while still meeting our contractual obligations to the resort. Cancellations 45 days prior to departure day of retreat April 6 will receive a credit toward a future retreat or event less a $500 late cancellation/processing fee. Cancellations before the 45 day deadline will receive a full refund less $100 processing fee. Below is a great site to check out and compare various travel insurance companies if you'd like extra peace of mind.